If you're tired of being buried under papers at your office desk, or swallowed up by boxes that continue to pile up in your garage, this workshop may be for you. "Unclutter Your Life Inside and Out," a class taught by Marilyn Nagel, is being offered as part of the Kaimuki High School Adult Education curriculum. Classes run Thursdays, 6:30 to 9 p.m., June 22 through July 6 at Kaimuki High School, 4705 Kaimuki Avenue. Cost is $15. Registration is being taken through today however, may be extended if there are still openings. Call 733-8460 for more information. The SPAMmobile returns to town this week for several weeks' worth of parking-lot visits that will provide an up-close and personal look at a big, blue Spam can-like vehicle. 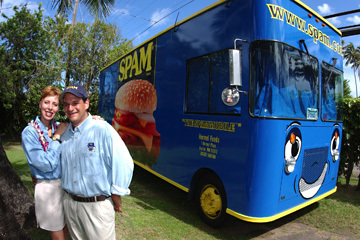 Paula Hoeffliger and Brian Callerame brought the SPAMmobile to Hawaii two years ago. The vehicle returns this week, making stops at various markets with goodies, including grilled Spam, recipe books and Spam beach ball .